What Are 3.5mm Audio Cables Used For? What Goes Into Making the Best 3.5mm Audio Cable? A 3.5mm audio cable provides an electrical path between an audio input device like your smartphone or MP3 player and a set of speakers like the ones in your car. They come in various lengths and are also commonly called aux cables. 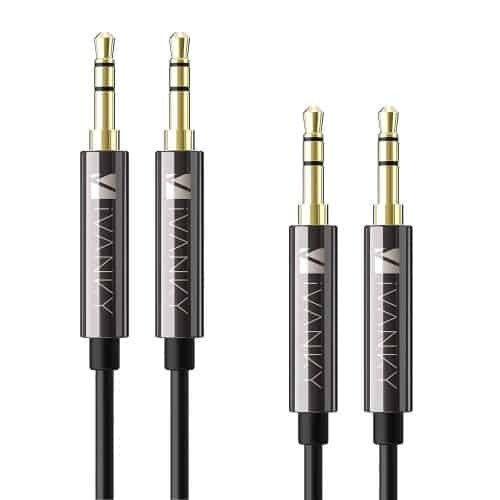 This buying guide will focus on providing you with the best 3.5mm audio cables that are used to connect consumer audio devices together worldwide. To be honest, all of the 3.5mm audio cables on this list really are great. Choosing the best was a bit of a challenge. 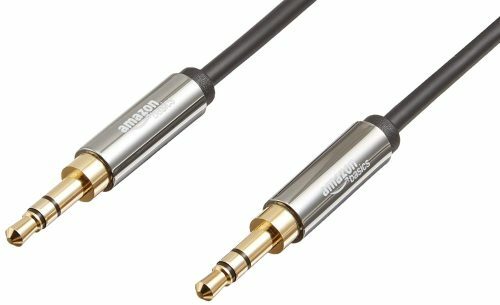 However, after a good amount of research, I recommend the iXCC 3.5mm audio cable available on Amazon. 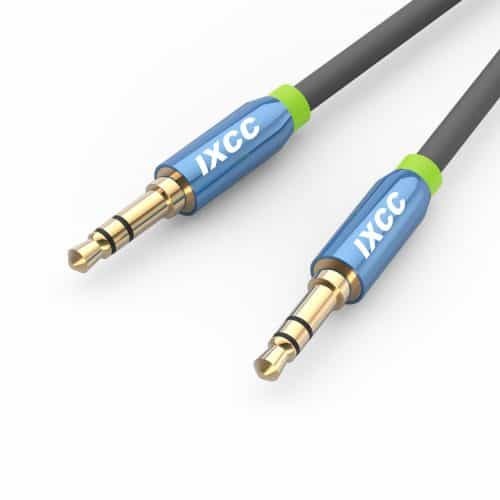 The award for best 3.5mm audio cable goes to iXCC. This is an excellent, rugged cable that is used by professionals and consumers alike. 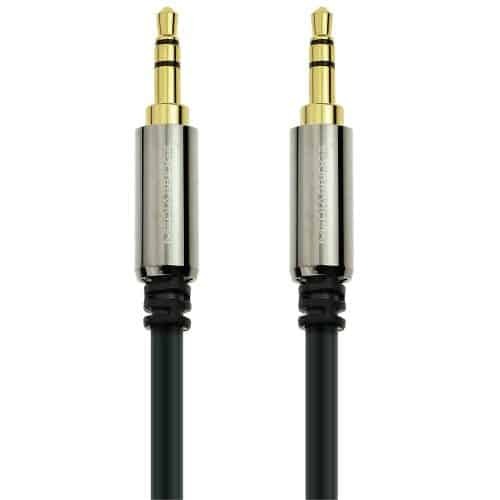 The cable uses the much-needed stepped connector design and has gold-plated contacts and a thick outer jacket. It also had a whopping 9000+ reviews averaging out to over 4.5/5 stars at the time this article was published. The only downside may be its color scheme, which may not match for some but this is completely subjective. The cable is available at a reasonable price and in several lengths. Check it out below! For consumers, 3.5mm audio cables are mainly used to connect audio output device to speakers. In professional audio, 3.5mm audio cables can be useful when listening to a new track on several different sound systems. For instance, let’s say you just bounced part of your new track to .wav and you want to listen to what it’ll sound like on your home stereo system, in your car, in your friend’s car, and on your uncle’s club system. You’d transfer the file to your smartphone and then use a 3.5mm audio cable to connect to each of these audio systems. 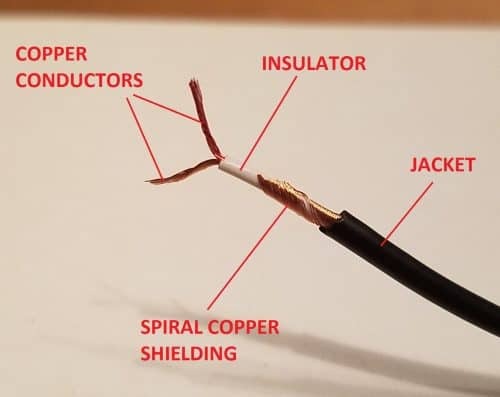 Just like in XLR cables used in pro audio, the shielding is a woven mat or spiral of copper fibers that wraps around the main conductors of the audio cable. Shielding reduces or eliminates electromagnetic interference from external radiation sources like your smartphone. This means the shield will reduce outside noise and pops from passing to your speakers and ruining your Gwen Stefani sing along session. Usually the denser the shielding weave is, the more noise and RF radiation it will reject. This also takes longer to manufacture and will ultimately cost more money. The conductor is what transmits the the audio signal from the audio device to your speakers. Copper is the best material for the cable conductors. Oxygen-free copper (OFC) is not known to have any significant increase in conductance. It’s all marketing hype. Still, some audiophiles insist on having it even if it costs them more. Heavier-gauge conductors will reduce flexibility and increase capacitance, which we’ll talk about later, but are more durable. Cotton placed between conductors and shielding can help eliminate friction and static discharge interference. The insulator is the material that surrounds the bare copper conductor inside the cable. some manufacturers inject nitrogen into the insulators – this doesn’t make a difference, it’s just fancy marketing. PVC is a good choice for durable and reliable jacket material. We want a cable with a high bend lifespan, which is the number of bends that the cable can withstand before failing. Heavier-gauge conductors increase the overall capacitance of the cable measured in picofarad per foot (pF/ft). Higher capacitance can modify the voltage signal being transmitted through the conductors, therefore distorting the audio being reproduced by speakers, monitors, headphones, etc. Very thick insulation will reduce capacitance. Capacitance with 3.5mm audio cables is largely irrelevant to us because the conductor wire gauge will not change or vary much from case to case. Don’t worry about it! If this 3.5mm audio cable will be for your car, anywhere between 2 ft to 6 ft should do. If you want to be able to pass the aux cord to someone in the back seat, shoot for a longer length like 10 ft to 15 ft. Many low-quality 3.5mm audio cables fail at the connectors. Gold-plated contacts are more resistant to corrosion but not 100% necessary. Silver contacts are actually more conductive, and they’re also cheaper than gold contacts. Step-down connectors are the best. They have a small step on them that allows room for the connector to fit into the case of your smartphone without popping out. The best 3.5mm audio cables have hard metal outer shells. These will add to the longevity and reliability of your cable in the long run. 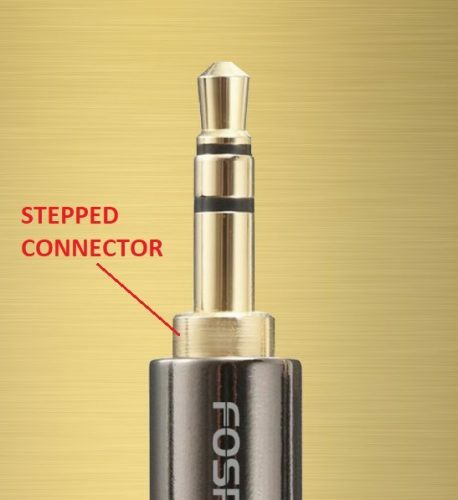 FosPower 3.5mm audio cable with step-down connector. Of course, when we are choosing the best 3.5mm audio cable we should naturally be concerned with sound quality. The video below shows an interesting experiment that compares the sound quality of four different aux cables. It also may be difficult to make a judgement due to the quality of the speaker being used in the experiment. Using a pair of studio monitors may tell a different story. And obviously just by looking at them, we can tell some will last much longer than others. Jacket material and connector build quality will make a difference in longevity, reliability, and fitment compatibility. Pay attention to the cable’s bend lifespan. These factors along with the prices were taken into consideration while formulating this list of the best 3.5mm audio cable available in 2019. Let’s take a look. Anker is a rapidly-growing electronics company focusing primarily on chargers and power banks. They also have branches that focus on smart-home devices, robotic vacuums, dash cams, and consumer audio including 3.5mm audio cables. Anker was established to counter the high-priced accessories that smartphone suppliers commonly forced consumers into purchasing. Products designed and manufactured by the company are known for their quality and innovation, and their 3.5mm audio cables are no exception. Let’s look at some of the features. iXCC is another electronics company focusing on cables and chargers. Users report that this cable is very well built, and it’s even found it’s way into the pro audio field according to some reviews due to it’s dual shielding and durability. It is very durable and will withstand daily use for a long time without failure. At the time that this article was published, this cable had nearly 7500 5-star ratings. The only con to this cable I can see is the color scheme, which of course is subjective but may not match the interior of your car or your other audio devices. This cable is also backed by a 2-year warranty. iVanky is yet another electronics company focusing on cables and chargers. Their 3.5mm audio cable is one of the best for several reasons. First, this cable uses both Nylon and TPE (thermoplastic elastomer) for the jacket materials. TPE is a heat-resistant plastic – this cable will be ideal for connecting audio devices to your car stereo, especially if you live in a place with a hot climate. TPE and Nylon are also very abrasion-resistant, adding to the durability of this cable along with a 15,000 bend lifespan and lifetime warranty. The cable uses oxygen-free copper conductors, which, if you remember from before, makes no difference but does add to the price. Amazon has become so big, that they now sell their own branded products under their AmazonBasics line. 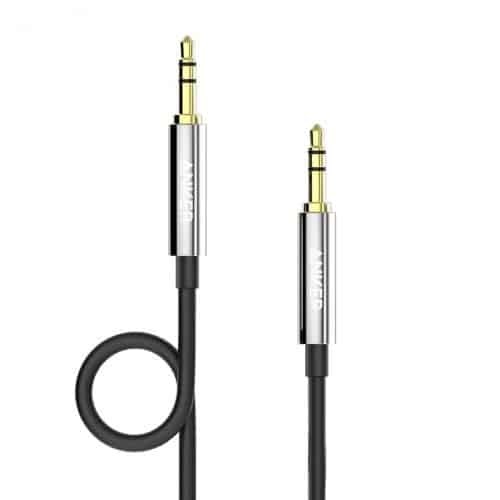 Part of their product listing is their 3.5mm audio cable, and it’s one of the best out there. Unfortunately, this cable only comes in an 8 ft length, so it may be a little too long for car stereo systems. It does have most of the standard features that you will find in the best 3.5mm audio cables, though. Another great choice is the 3.5mm audio cable from Mediabridge. One feature that makes this cable stand out from the rest is it’s strain-relief connector design. This will add to it’s reliability in the long run, since this is a very common failure point for audio cables. It also comes in a variety of lengths for many different applications, and utilizes 27 AWG conductors which are thicker than most other 3.5mm audio cables. Oxygen-free copper and nitrogen infused insulators are just marketing hype! Gold-plated connectors are a great choice for conductivity and corrosion resistance. Shielding will 100% make a difference in audio quality. It rejects radio interference and blocks outside noise from ruining your listening experience. Jacket material and connector build quality are essential if you want a reliable and durable cable that will last you many years. We’re all done here. Thanks for reading, and I hope this helps you make a great choice for your 3.5mm audio cable purchase!